In an earlier post, Part 1: Identifying the problems, I discussed how Ken Robinson’s video is helping education by shining a light on the problems, identifying the 3 principles that drive human life, and then he offers an existing solution. The first principle is about individuality. 2nd Principle that drives human life is curiosity. If you can light the spark of curiosity in children they will learn without any further assistance. Children are natural learners. It’s a real achievement to put that ability out or to stifle it. Curiosity is the engine of achievement. This is the true goal of an educator: to encourage students’ curiosity. The teacher needs to create a climate of curiosity for his/her subject matter. If the teacher does that, the majority of students will embrace what’s being taught because they are naturally curious. Unfortunately, I have some students at the junior level who have almost lost their natural curiosity by the time they get to me. The flame is not completely out, but they have been disengaged for so long that they don’t know how to begin fulfilling some of the tasks I ask of them. I am saddened by this fact. I spend many of my teaching hours trying to undo the damage that has been done to the psyche and confidence levels of my students. However, one of the greatest joys I have in teaching is when a disengaged student finally engages and trusts me enough to ask or answer questions. That engagement is a sign that curiosity is still alive within him/her, which means the desire to learn is still present. All is not lost. One of the effects in this culture is to deprofessionalize teachers. There is no system in the world that is better than its teachers. That statement is so powerful, I need to repeat it: “There is no system in the world that is better than its teachers.” Therefore, if the government, big business, and the media have all worked together to destroy the profession of teachers for their own monetary gains, they are ultimately destroying our country. The question is, to what gain? If the general public is buying into this propaganda, they are also contributing to the destruction of our country. I can’t imagine why people would do that on purpose. The only answer is that the general public has been intentionally misinformed. Teachers are the lifeblood of the success of schools. Teaching is a creative profession. Teaching properly conceived is not a delivery system. You are not there just to pass on received information. Great teachers do that, but what great teachers also do is mentor, stimulate, provoke, engage… You see, in the end, education is about learning. If there is no learning going on, there is no education going on. People spend a lot of time discussing education without ever discussing learning. The whole point of education is to get people to learn. You can be engaged in the activity of something, but not really achieving it. . . . The role of the teacher is to facilitate learning; that’s it. Sadly, I know there are teachers currently working who do not facilitate learning. There are a few in every school, but they are not the majority. The whole basis for starting these tests was to weed out the “ineffective” teachers. Who really thinks that a billion dollar industry is needed to get rid of bad teachers? 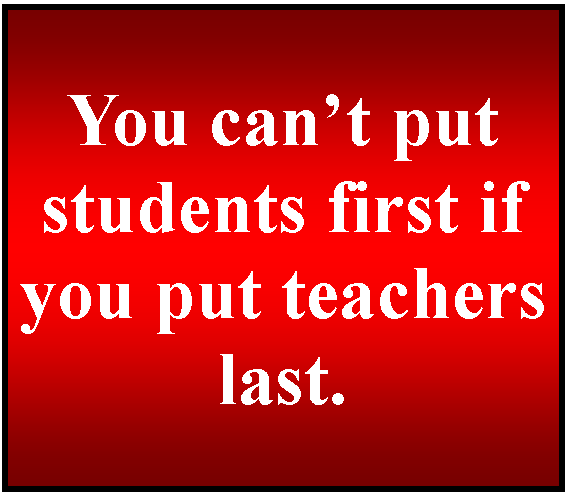 Ask any teacher, counselor, or student who the ineffective teachers are, and one will get immediate feedback. Everyone knows who the teachers are that show movies instead of teach their subject matter, who give answers to diagnostic tests instead of teaching the material and checking if their students understand it. How much money would that cost? Part of the problem is that the dominant culture of education has come to focus on, not teaching and learning, but testing. Now testing is important. Standardized tests have a place. But they should not be the dominant culture of education. They should be diagnostic; they should help. Testing should support learning; it shouldn’t obstruct it, which it often does. I am not against all testing, obviously. We need to check what our students know and don’t know; we need to find out as teachers what we need to go back over so our students actually learn the material. I have diagnostic tests that tell me if they understand it. If they don’t, they come in to work with me one-on-one until they do. If it were my error, I re-teach it. Simple. Cost effective. Immediate. We have had these type of tests since I was in grade school. Why do we need extremely expensive tests when good teachers already create valid assessments? The argument may be that depending on the teacher, school, district, region, or state, some students may not be getting the same education as other students. That’s true, but it starts and ends with the teacher, not the test. Truthfully, this all begins with good leadership. A good leader knows he/she has to hire the right people and then get out of the way and let them do their jobs. If a teacher is struggling, a good leader will provide the support needed to help that teacher or have the strength to fire the teacher and find a better qualified educator. Instead of curiosity, we have a culture of compliance. Our teachers and students are encouraged to follow routine algorithms, rather than to excite that power of imagination and curiosity. This is the type of education the general public is allowing for their children. Yes it is free education, but at what cost? Doesn’t every child deserve the right to the best education possible? The type of education that will nurture individuality, curiosity, and creativity, rather than compliance? In case there are readers who think I am exaggerating, here is a resolution document from a local charter school against the Common Core Standards. They know that educating their future leaders is being stifled with this type of narrow, compliance-based standardization of education, which is driving the state tests. Let’s give all of our children a fighting chance, whether they are poor, rich, or somewhere in between. This entry was posted in Come Hell or High Water, Education Reformation, Uncategorized and tagged Children, Education Reformation, Family, Parents, Sir Ken Robinson, Students, Teaching. Bookmark the permalink.